VMEbus 32 MB Memory Expansion Module, supporting SRAM, EPROM or FLASH with battery backup & Watch-dog. The CM-MEM-40 is a 32 bit general purpose VMEbus Memory Expansion Board that incorporates features demanded in military & industrial applications. Maximum on-board capacity is 32 MB, distributed in 16 banks, each one populated with four 32 pin JEDEC devices of 512KB of capacity. Memory chips of SRAM, EPROM or FLASH may be installed in a flexible way, supporting all standard JEDEC chips. Jumpers allow mapping the board in any of the 128 memory blocks, 32 MB size, available in the Extended A32/D32 addressing range. On-board programming is carried out with +5VDC only. The CM-MEM-40 32 MB SRAM version (CM-MEM-40/S) incorporates a watch-dog & stand-by rechargeable battery, allowing for use as a solid state hard disk (RAM disk). Capacity: Up to 32 MB in steps of 2MB. 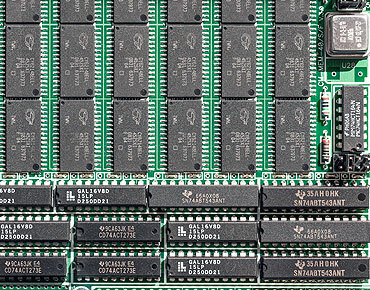 The board incorporates 16 independent memory banks of 2MB & 32 bit wide. 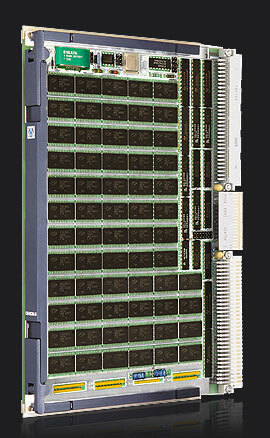 A bank is composed by 4 JEDEC chips of 512 KB capacity. 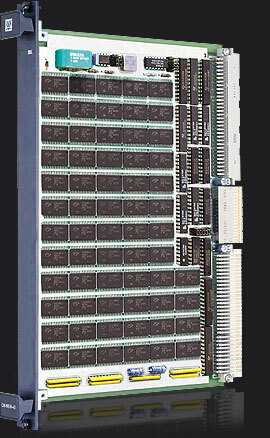 SRAM Memory: The CM-MEM-40/S allows up to 32MB of SRAM. Accepted chips are rated from 35 to 12 ns of access time. The total amount of SRAM can operate in "stand-by". Flash Memory: Up to 32 MB. The board supports new generation Am-29F040 devices requiring only +5V for its on-board erase or programming. 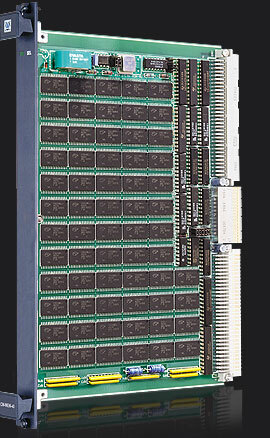 EPROM Memory: Up to 32 MB. To allow external programming the board offers 64 sockets for 27C4000 devices. Wait-state Generator: Equates the VMEbus access time versus the speed of installed devices. A jumper allows 0, 1, 2 or 3 wait states for chips from 35 to 120 ns. Back-up Battery: A Ni/Cd rechargeable battery (100mA/h) supplies the stand-by voltage. Watch-dog: A MAX-690 monitors the +5VDC and administrates the back-up battery. Power consumption: +5VDC @ 600 mA (3 Watts). CM-MEM-40/A: IEC-297 mechanics for 19 inch racks with I/O on front panel. CM-MEM-40/B: Military IEEE P1101 wedgelock mechanics for ATR enclosures. 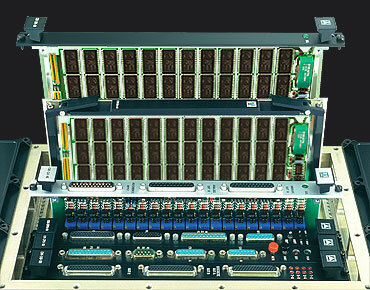 On-board memory capacity up to 32 MB. Flexible memory chip insertion; SRAM, EPROM or FLASH. 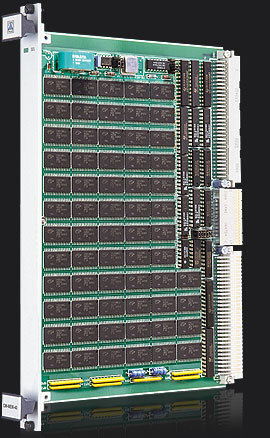 16 memory banks with four 32 pin JEDEC devices of 512KB capacity. Fast CMOS low heat design (3 Watts). Supports all standard JEDEC chips. Module mapping to any 128 memory blocks, 32 MB size. Watch-dog timer & Stand-by rechargeable battery incorporated. Module assert DTRACK* in 100ns. Up to 64 chips in CM-MEM-40/F versions. CM-MEM-40/S/F allows FLASH & SRAM combinations up to 16 MB. S1: Memory expansion with 8 MB SRAM. Battery & Watch-dog. S2: Memory expansion with 16 MB SRAM. Battery & Watch-dog. S3: Memory expansion with 32 MB SRAM. Battery & Watch-dog. F1: Memory expansion with 8 MB FLASH. Battery & Watch-dog. 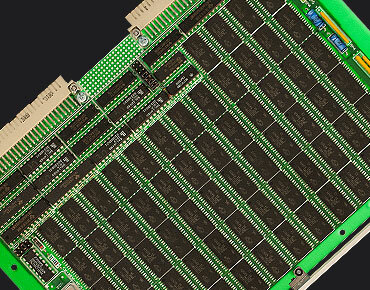 F2: Memory expansion with 16 MB FLASH. Battery & Watch-dog. F3: Memory expansion with 32 MB FLASH. Battery & Watch-dog. SF: Memory expansion with 8 MB SRAM + 8 MB FLASH. Battery & Watch-dog. - Memory expansion board with 8 MB SRAM. Battery & Watch-dog. LEVEL 1, CM-MEM-40 MAP: User´s manual. Module hardware functional description oriented toward software development. LEVEL 2, CM-MEM-40 MMT: Maintenance manual with BIT scope, test point wave forms. logic analyzerdiagrams, etc. LEVEL 3, CM-MEM-40 NAT: Maintenance manual according to NATO forces. Includes the above manuals plus mechanical & electrical schematics, NATO list part number, extended functional description, maintenance & calibration procedures for in-service equipment. Wind River Systems VxWorks Tornado: The CM-MEM-40 is supported by VxWorks Tornado & is ideal for developing real time software under UNIX environments. A complete "C" language driver in source code is available at low cost. Drivers include a floppy-disk & user's manual.